Florida’s warm climate makes the state a notorious hotspot for tourists and residents alike, many of whom ride motorcycles, whether on road trips or to commute to and from work. Unfortunately, there are risks that come along with using a motorcycle, as operating a lower-profile vehicle often makes it difficult for motorists to see the rider, resulting in collisions, and potentially serious injuries. One of the most common types of motorcycle accident-related injuries that riders face is road rash, which occurs when a person’s exposed skin skids across the pavement, causing painful abrasions that can have long-term health consequences. Treating these types of injuries can be expensive, making it especially important for those who suffer from road rash, to contact an experienced motorcycle accident attorney who can help them seek compensation for their medical expenses. Road rash is generally described as a friction burn, although it is perhaps best understood as a number of abrasions caused by scrapes. However, many physicians treat these injuries as burns because it is the friction caused by the skin coming into contact with the asphalt that causes layers of skin to scrape away. In fact, there are actually a number of similarities between road rash and burns. For instance, medical professionals use burn-based classifications to describe the severity of road rash injuries. First degree road rashes are relatively minor and are characterized by small scrapes, bruising, redness, tenderness, and slight bleeding. When an injury reaches the level of a severe rash, extreme swelling, bleeding, and a feeling of heat radiating from the wound, it is usually classified as a second degree friction burn. In serious cases, an injured party may even be able to see exposed tendons, nerves, and muscles. Finally, third degree road rash injuries, which are the most severe, occur when the skin is completely scraped off and muscle, tendons, bones, and nerves are exposed over a large area of the body. Although third degree road rash is the most serious, many victims don’t experience severe pain, as their nerves are often damaged. Road rash injuries usually primarily affect the extremities, including the lower legs, outer thighs, knees, palms, feet, and shoulders. Motorcyclists who don’t wear helmets may even suffer road rash on their faces. Although road rash usually heals within a few weeks, it is also not uncommon in cases of second or third degree road rash for an injured party to require skin grafting to repair the layers of damaged skin. These individuals are also much more likely to suffer from infection, as the damaged skin and tissues are exposed to germs and bacteria. Road rash wounds also penetrate several layers of skin, so it is also possible that a victim will suffer from scarring and even disfigurement. 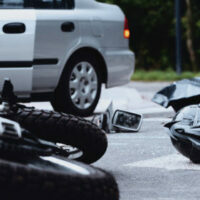 If you suffered road rash in a motorcycle accident, you could be entitled to compensation from the at-fault party. To learn more information about your legal rights and options from an experienced motorcycle accident attorney, please call Boone & Davis in Fort Lauderdale at 954-566-9919. We offer free consultations to discuss the details of your case.